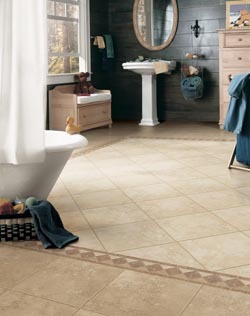 For elegance that flatters any décor, choose ceramic tile flooring for your home or business. Turn to our family-owned-and-operated flooring store for a wonderful selection and expert assistance. It is our goal to make your shopping experience with us rewarding and fun. Our design and sales professionals know all about brands, styles, patterns, and colors of ceramic tile. Let us show you the decorating possibilities that tile offers. Choose from light to dark finishes, from subtle neutral shades to vibrant colors, and from classic to wood-look ceramic tile in a variety of top-notch name brands. Come to us for tile flooring that is perfect for your home or business, as well as other applications, such as ceramic wall tile. Our residential and commercial customers value tile for its versatility. As tile resists water, spills, and stains, it is ideal for any room in your home, especially those that have high humidity levels. Tile is clean. Dry mop to remove dust and dirt and wet-mop with a tile cleaning product. This floor covering serves a useful purpose for a number of applications, for it is great for floors, but it also works well on walls. We recommend ceramic wall tile for backsplashes in the kitchen and bathroom, as well as any room where you would like to make a statement. You can mix and match colors, shapes, and sizes of tile to serve as a focal point for your kitchen, bathroom, or any room of your home or business. Perhaps, you have seen it in magazines or on TV. A popular new trend is wood-look ceramic tile. Everyone is excited about the endless decorating possibilities. Tile mimics the beauty of hardwood with subtle grain and patterns, as well as rich hues that bring the beauty of nature inside. Add wood-look ceramic tile to rooms with high levels of moisture, such as the basement; or rooms where water is used, such as your kitchen or bathroom. You would never dream of adding solid wood to these rooms for fear of damage, but tile allows you to be as brave and bold as you choose when decorating. To reveal the true beauty of tile, ask us for professional ceramic tile installation. Laying tile flooring requires precision and careful attention to detail. Let us send a team of expert installers to your home or business to ensure the long-lasting quality of your ceramic tile. These installation professionals start with a clean and level subfloor and then take exact measurements to avoid waste as tiles along the edges of a room have to be cut to fit. They use a sufficient amount of mortar, install ceramic tile with an eye to pattern and placement, and then add the right amount of grout. When they are done, you are the proud new owner of lovely tile flooring that you can walk, work, and play on for many years to come. Contact us today to schedule professional installation of ceramic tile flooring in your home or business. We proudly serve Yuma, San Luis, Somerton, Wellton, and Dateland, Arizona, and the surrounding areas.